(*) Highly technical, eh? - not sure I understand the difference, to be honest! Don’t worry about the difference. A grace note that looks like an 8th note with a slash is (or “was” in the 17th century) just another way of drawing grace note that looks like a 16th note, ie., the slash is just a quick and dirty way of drawing another flag. Neither format implies anything about whether it should be played before the beat (taking its time value from the preceding note) or on the beat (taking its time value from the following note). That question is decided on the basis of what we know (or think we know) about performance practice in the time and place the thing was written, not what the grace notes look like. This article on musical ornaments shows the difference. The Appoggiatura, as shown in the musical example, is not what is expected for traditional music. You should use an Acciaccat﻿ura - the one with the stroke. It might not be exactly as played in traditional music, but the tradition will guide you to the exact interpretation. Having said that, i've just looked up a couple of music books. One, for fiddle, has the stroke in the grace notes. The other, for bagpipes, doesn't, but they have a stylised set of grace notes anyway. That's what I wanted to hear. Thank you! This article on musical ornaments shows the difference...You should use an Acciaccat﻿ura - the one with the stroke. ...Having said that, i've just looked up a couple of music books. One, for fiddle, has the stroke in the grace notes. 'em seem to be without the stroke, but I guess I now 'know' what I'm doing (hollow laughter...). Indeed, and these statements in the article back up what I said, above. Whether the note should be played before or on the beat is largely a question of taste and performance practice. The implication also varies with the composer and the period. For example, Mozart's and Haydn's long appoggiaturas are – to the eye – indistinguishable from Mussorgsky's and Prokofiev's before-the-beat acciaccaturas. 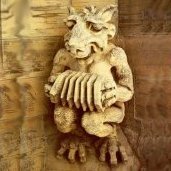 This thread touching on a nagging issue for me that perhaps someone can help with. 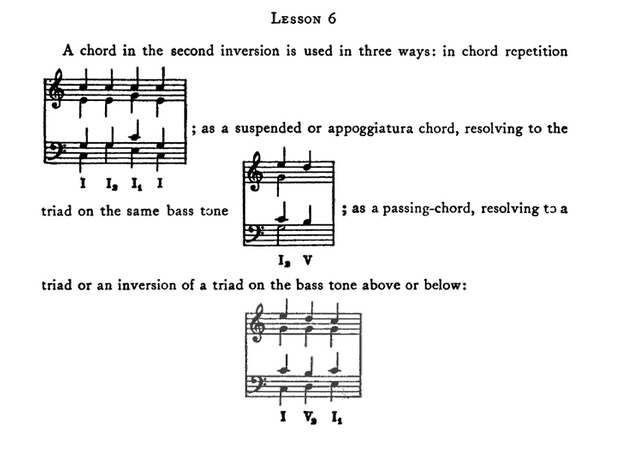 In "Advanced Ear Training and Sight Singing" by George A. Wedge he gives an example of how to use the second inversion in three ways, one of which is as a "suspended or appoggiatura chord". But I have never been able to reconcile his example with the article mentioned above nor the explanations given here. I have attached a screenshot of the page (which is in the public domain, by the way). Is there a difference in an appoggiatura and an appoggiatura chord? Did George just not give an example of grade note application? Glad this thread came up !! In classical harmony (or, to use a dirty word, music theory), collections of notes played simultaneously are considered either consonant or dissonant. Dissonance is not necessarily something to be avoided, it is the stress part of the continuing ebb and flow of stress and release that keeps music moving forward. Consonant sounds can stand on their own, while dissonant sounds are expected to resolve to consonance. If you just throw a random dissonance into a piece of music, it will likely sound like just a wrong note. There are ways of using dissonances that avoid this consequence, and there are names for the different ways dissonances can be used tastefully. One, for instance, is a passing tone. If one voice is singing a low G while another is singing G an octave higher, then descending to F and E while the first voice is still singing the low G, then the F is dissonant against the low G, but the high G and the E are consonant. The music works because the dissonance resolves to a consonance, and we call the F, in this instance, a passing tone, since it passes between two consonant tones. Another effective dissonance is the suspension. It's a note that was consonant in a previous context, but it is still sounding after the context has changed and it is dissonant in the new context. Suppose you play an F chord and then a G chord, but you keep an F playing into the G chord. Now the F is dissonant to the notes of the G chord but the ear accepts it because it was consonant previously. But it needs to resolve, usually down to an E in the next C chord. Centuries after composers began doing this it became so popular that we now call the whole thing a dominant 7th chord, but that's where it started. Another way to use a dissonance is called an appoggiatura (a note that “leans” on another note). It's a note one step above or below a consonant note and played just before it. The use of an appoggiatura as a grace note is just a specialized use of the appoggiatura. Your source refers to a 2nd inversion of a chord as an appoggiatura chord. I suppose this is because two notes in the chord are dissonant and both resolve as appoggiaturas. The 2nd inversion chord has the 5th in the bass, and both the root and the 3rd are considered dissonant over the 5th. They both resolve downward to make a consonant chord built on the 5th. However, the term “appoggiatura chord” is new to me. [Edited again to add:] By the way, the figures under the musical examples in the above screen shot are wrong. Under each of the 2nd inversion chords, a roman numeral has a little 3 beside it. In each case that 3 should be a 6 over a 4, and the 1’s by the roman numerals under the 1st inversion chords (3rd in the bass) should be 6’s.